You’ve made it through another year, which means you deserve some flashy & bright nail art– and this one doesn’t disappoint. This design calls for minimal hand drawn steps, which means even if you have zero nail skills you can still have an A+ look. 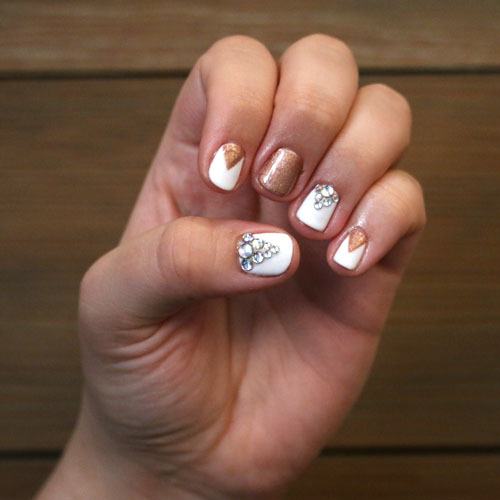 To ensure you have the perfect manicure while toasting champagne, we’ve asked Neroli Salon & Spa Nail Designer, Lisa to give us the low-down on glue on nail art. Rose Gold Triangle: Using your fine point paint brush, starting on either outer edge of your cuticle, paint a slanted line going towards the middle of your nail. Repeat on the opposite side, and connect the point of the triangle. Fill in. Two to three layers may be needed to get full coverage. Geometric Gems: Before placing these on your nails, you’ll want to figure out what sizes to use to create the right shape. I let my nails dry and placed them on my own nail to see, but you can also lay them down on a piece of paper or a flat surface. I used bigger gems at the top and center, and smaller ones as I went down. TIP: Once you’re ready to apply them. paint a little nail glue where the gems will be (you can also use top coat if you don’t have nail glue). I use my plain old finger to pick them up, and just press firmly down onto the gem to pick it up (you can also wet your finger with a little water to make it stick better). Tweezers are also an option as well. Place the gems into place, and wait one minute for them to fully dry. Step 7: Once your art has set for about 5 minutes, apply a thin top coat. Make sure to cap the edges of your nails to seal everything in, too! This step helps your polish application to last a lot longer. Use some fast dry drops or spray to help the polish dry quicker.